"Gilbert and Sullivan" refers to the Victorian era partnership of librettist W. S. Gilbert (1836–1911) and composer Arthur Sullivan (1842–1900). The two men collaborated on fourteen comic operas between 1871 and 1896, of which H.M.S. Pinafore, The Pirates of Penzance and The Mikado are among the best known. Gilbert, who wrote the words, created fanciful "topsy-turvy" worlds for these operas, where each absurdity is taken to its logical conclusion—fairies rub elbows with British lords, flirting is a capital offence, gondoliers ascend to the monarchy, and pirates turn out to be noblemen who have gone wrong. Sullivan, six years Gilbert's junior, composed the music, contributing memorable melodies that could convey both humour and pathos. 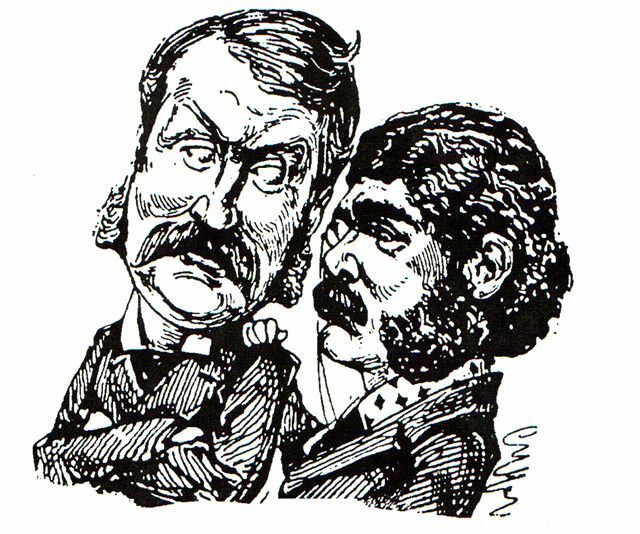 In the past 125 years, Gilbert and Sullivan have pervasively influenced popular culture in the English-speaking world, and lines and quotations from the Gilbert and Sullivan operas have become part of the English language (even if not originated by Gilbert), such as "short, sharp shock", "What never? Well, hardly ever! ", "let the punishment fit the crime", and "A policeman's lot is not a happy one". The operas have influenced political style and discourse, literature, film and television, have been widely parodied by humorists, and have been quoted in legal rulings. Click here to view all products related to Gilbert & Sullivan.